Cristiano Ronaldo could reportedly see some familiar faces arrive at Juventus as it’s claimed Isco and Marcelo are both on their radar. The Bianconeri are in a strong position this season as they sit eight points clear at the top of the Serie A table after 13 games, winning 12 of those outings. 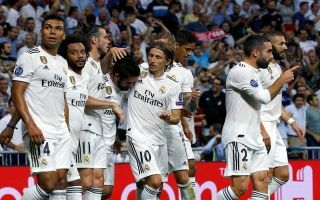 Further, they’ve comfortably booked their place in the knockout stage of the Champions League, and so with Ronaldo leading their charge, they look very strong in their pursuit of major honours which includes a possible eighth consecutive Scudetto. With that in mind, it doesn’t appear as though they need to strengthen Massimiliano Allegri’s squad further, but according to Tuttosport, they’ve been linked with a double swoop for Real Madrid pair Isco and Marcelo. The Spanish playmaker was snubbed by Santiago Solari this week for their Champions League clash with Roma, while he has struggled to hit top form this year as he’s managed to contribute just two goals and an assist in 13 appearances in all competitions. With that in mind, question marks have seemingly been raised over his future at the Bernabeu, with the report noting that Manchester City are also interested in him, if he is set to move on. As for Marcelo, Tuttosport claim that doubts remain over his future at Real Madrid, but Alex Sandro would surely have to firstly move on before his compatriot arrived in Turin as neither would settle for a back-up role. In turn, it remains to be seen if that’s part of Juve’s plan moving forward, but for now, there could be enough concern there for Madrid that the Turin giants are preparing a double raid to set up a Ronaldo reunion for the influential duo.